You'll find Terwillegar homes for sale in Southwest Edmonton. The community consists of Terwillegar Towne ( designed for a small town feel within the city) and Terwillegar South. The neighbourhood is very close to Anthony Henday Dr., giving residents quick and easy access to other parts of the city. Real estate in Terwillegar runs the gambit for variety. There are exclusive million-dollar luxury homes, move-up single-family homes, as well as a good selection of condos and townhouses. Terwillegar is in a good location close to plenty of shopping and schools, as well as parks. Read more about Terwillegar homes for sale below the listings! 119 Properties Found. Page 1 of 14. 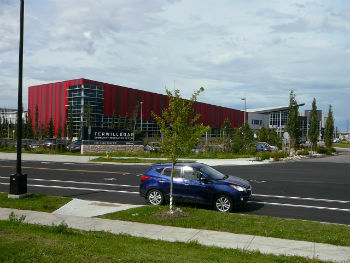 Check out Terwillegar condos for sale if you want to live in a community where you won't spend all your time in the car. When it comes to shopping, there's a Save On Foods that's just a minute or two away, making it easy to get groceries. Other shopping in the area can be found nearby off Windermere Blvd. where there's a Canadian Tire, Walmart, Cabela's, London Drugs and a Superstore, to mention just a few of the stores. There are a few schools in Terwillegar including Esther Starkman Elementary and Monsignor William Irwin Catholic School. Also nearby are Mother Margaret Mary Catholic School, Archbishop Joseph MacNeil Catholic School and Lillian Osborne High School. Certainly Terwillegar real estate is highly sought thanks to the abundant green space in the area. Terwillegar Towne Neighbourhood Park has a small lake surrounded by sports fields and open grass fields. Tomlinson Park has a large playground which is a hit with smaller children. Just east of Terwillegar, past Magrath Heights, is the Whitemud Creek ravine and greenspace, which makes for a super place to go for a hike or take the dog for a walk. If you enjoy fishing, the North Saskatchewan River is just west. Take your rod and see if you can hook a trout or two. Maybe take a picnic and spend a nice leisurely day fishing down by the river. If you would like to view any Terwillegar homes for sale in Edmonton, please contact MaxWell Challenge Realty today. Call our office at 780-990-7777 and we'll help you find your dream home.